This is an update of what has been happening in Arcadia. The ballot initiative that Saving Arcadia proposed did not get enough valid signatures to qualify for the November ballot. Despite collecting over 3,500 signatures, some of the signatures were invalidated by the County Recorders Office and others were disqualified by the Arcadia City Clerk. Most of the signatures that were disqualified did not match the “Signature Card” on file with the County Recorders Office. We considered legal action against the city to recover some of the signatures that were disqualified. After a thorough analysis, it became clear that our odds of success in court would be very slim. But all of our hard work collecting signatures was not in vain. Your signatures were instrumental in getting the city to adopt new building codes for the HOA's that are more restrictive than the previous codes. For the first time, the use of the FAR (floor area ratio) was defined and put in the code, as other adjacent cities have been doing to control home sizes. Also, due to the heightened awareness of the mansionization problem in the city, residents came out in large numbers to elect April Verlato and Peter Amundson to the City Council. April and Peter support our goals of keeping Arcadia a "Community of Homes"--not a city of mansions. In other news, on July 19th the City Council denied an appeal by the residents of S. 5th Avenue regarding plans for a 3,588 sq. ft. two-story home located at 1101 S. 5th Avenue. Despite the signatures of over 23 residents and direct opposition from neighbors on both sides, behind and across the street from the project, the City Council voted 3 to 2 to approve the project. 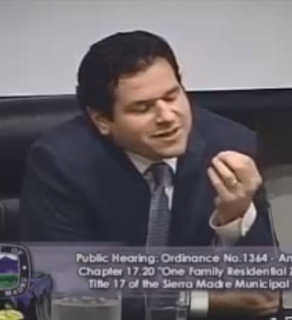 Most surprising (and disappointing) was the vote by our Mayor, Tom Beck. Despite his repeated assurances that he is in favor of curbing oversized construction, he voted in favor of approving the project. In response, the neighbors filed a lawsuit against the City of Arcadia on August 23rd in Los Angeles Superior Court. You can call Tom Beck and ask him why he voted this way at (626) 355-3300. In better news, on July 26 the Planning Commission denied the appeals of two builders to construct oversized homes in South Arcadia. One project is located at 920 S. 5th Avenue. The second project is located at 1510 S. 4th Avenue. We are pleased that the Planning Staff adhered to the Design Review Guidelines and denied the appeals. We can expect at least one appeal from Phillip Chan in regard to 920 S. 5th Avenue. That appeal will be reviewed by City Council in a few weeks. On August 9th the Planning Commission heard an appeal from a builder regarding 1817 Mayflower Avenue. The planning staff recommended denial of the appeal and the Planning Commission agreed. At that same meeting the Planning Commission approved construction at 2119 Holly Avenue. It will be a 4,691 sq. ft. prairie-style, two-story residence with an attached 333 sq. ft. one-car garage, a 427 square-foot detached two-car garage and a 692 square-foot basement. The development requires a proposed zoning modification for a 25’-½” front setback in lieu of the required 41’ setback. The FAR on this property will be 49.3% and that doesn’t include the basement. Council member, April Verlato, questioned the decision. It will be reviewed by City Council. Lastly, the residents near 405 Hillcrest Boulevard agreed to file an appeal with the Planning Commission regarding proposed construction on their street. The proposed development would be the largest house on the block--on the smallest lot. That hearing will be in September. Your signatures to support the ballot initiative have shown the city council that the residents of this city need to be listened to. Saving Arcadia will continue to keep you informed and ask for your help. 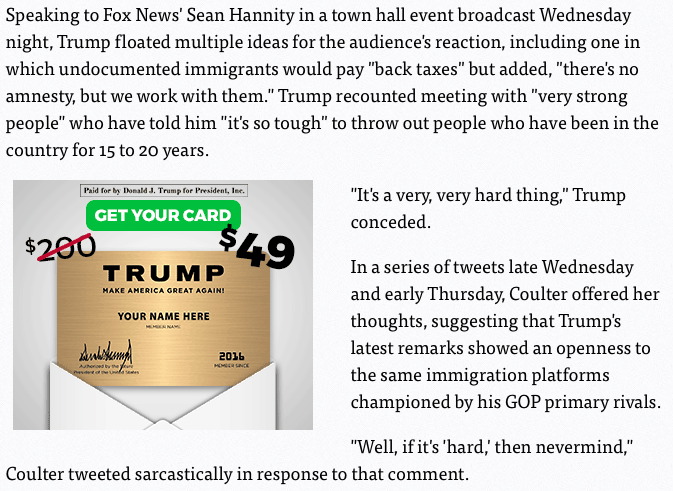 Donald Trump's flip flop on immigration continues to get a big reaction. 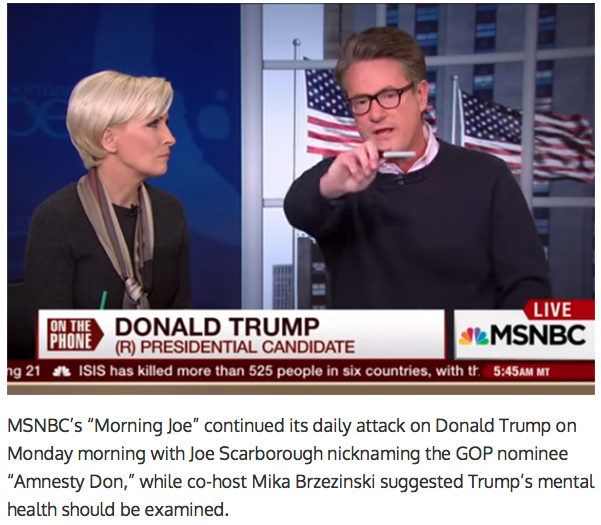 Former Trump supporter Joe Scarborough has at the orange quick change artist. 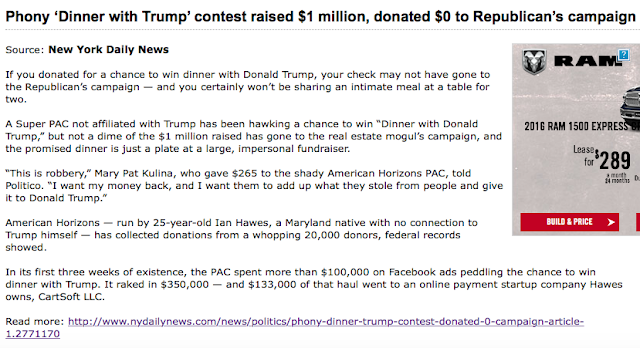 Did you win a dinner with Donald Trump? Trump biographer drops a bombshell on CNN — and exposes his cocaine-dealing crony (Raw Story - link): Donald Trump biographer David Cay Johnston Saturday on CNN said that the Republican presidential candidate once protected a convicted felon who was charged with cocaine trafficking. Johnston was referring to Joseph Weichselbaum, who was indicted for drug trafficking in 1985. Trump campaign CEO once charged in domestic violence case (Politico - link): Stephen K. Bannon, the new CEO of the Donald Trump campaign, was charged with misdemeanor domestic violence, battery and dissuading a witness following an incident in early January 1996, though the case was ultimately dismissed, according to a police report and court documents. Bannon, through a spokeswoman, said he was never interviewed by the police about the incident. Bannon pleaded "not guilty" to the allegations and was represented by a local criminal defense attorney during the proceedings. The couple — who had twin girls — were divorced shortly after the criminal charges were dropped in August 1996. There had been a history of physical altercations in their relationship, Bannon’s then-wife relayed. "In the beginning of their relationship, she said they [had] 3 or 4 argument that became physical and they had been going to counseling. There has not been any physical abuse in their arguments for about the past 4 years. 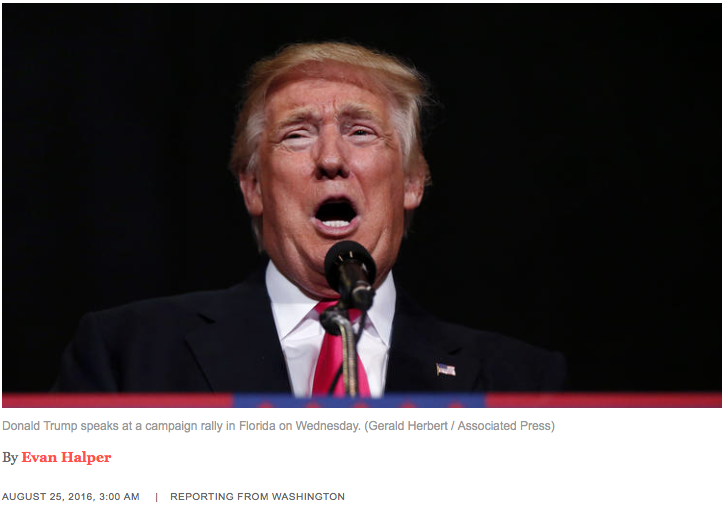 Donald Trump Uses Shooting of Dwyane Wade’s Cousin to Peddle Dangerous Stereotypes (The Daily Beat - link): Has there been a more feckless, disconnected and intellectually lazy major party nominee for president in the modern era? By any measure, the answer is no. Donald Trump, a man known for hurling racially-charged brickbats of intolerance, spent recent days spewing vile stereotypes in a ham-fisted attempt to appear more sympathetic to African American voters and blaming Democrats for the social maladies that tend to plague many of nation’s largest cities. The fact that the one-time reality television personality originally misspelled Wade’s first name, did not mention Nykea Aldridge by name and failed to extend condolences to the family was largely greeted with derision. As the nation grapples with meaningful solutions to some of our most pressing dilemmas—including how to stem the tide of gun violence—and a family was dealing with a tragic loss, Trump was taking a victory lap. Trump, who appears to get his sketchy public policy ideas from tooling around fringe websites, immediately pounced on the horrific incident as proof that he deserves more support from black voters. In recent days, Trump has attempted to parlay his feigned benevolence for social disparities in predominantly non-white, inner city neighborhoods into political gains among white suburbanites. 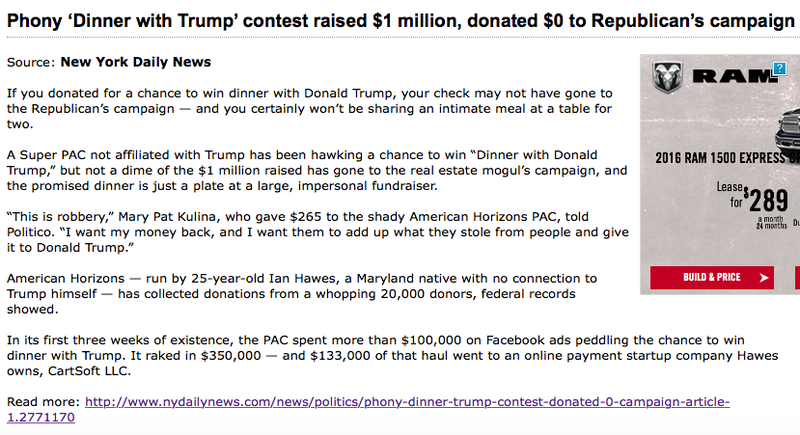 His ripped-from-the-headlines message may have won Trump a fractured Republican primary. But, over time, his off-the-cuff and sometimes scripted remarks have proven costly—to both himself and the broader GOP. 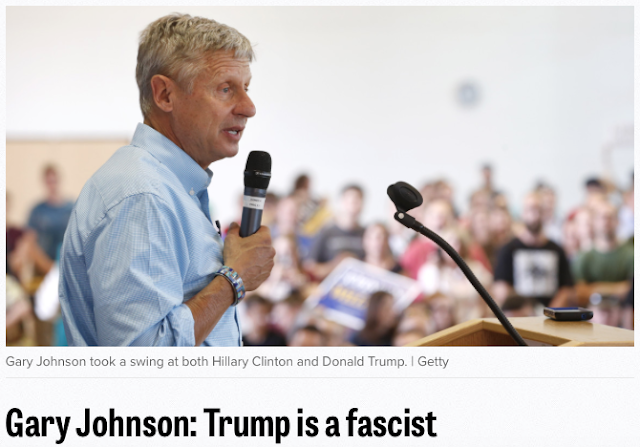 Party insiders see him as a wrecking ball, concerned more with his own cheering crowds of true believers than building the kind of broad coalition of support that could win him the presidency and help down-ticket candidates. Trump campaign donor linked to mafia, Putin loyalists (This Week - link): Last month, Felix Sater, a businessman with ties to the mafia and "loyalists of Russian President Vladimir Putin," paid Donald Trump a visit at Trump Tower for "confidential" reasons, Politico reported Friday. 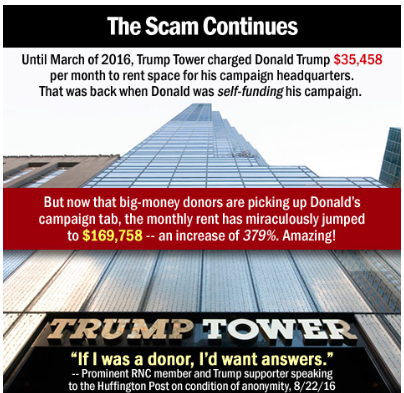 That same month, Sater gave the Trump campaign $5,400 — the maximum contribution allowed. Sater and Trump's ties go way back; the two once co-developed a Trump project and Trump briefly hired Sater. However, Trump has long maintained that his relationship with Sater is "distant" and stated under oath that he "would not recognize Sater if the two were sitting in the same room," Politico reported. Around 1999, Sater joined Bayrock, a real estate firm that had offices in Trump Tower and pursued business ventures with Trump. 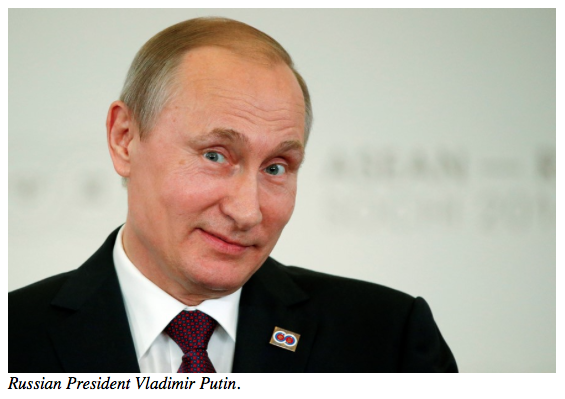 Bayrock is now being rocked by allegations made in a lawsuit brought by a former executive of unexplained cash infusions from Russia and Kazakhstan and receiving financing from a firm used by Russians "in favor with" Putin. Around 2010, Sater went to work for Trump directly, carrying a Trump Organization business card that described him as a "senior advisor to Donald Trump." The revelation of Sater's contribution and recent Trump Tower visit come at a time when Trump's pro-Russian stances, his relationship with former campaign chairman Paul Manafort, and his campaign's role in softening the Republican Party's support for Ukrainian resistance to Russian incursions in its territory have all brought the New York billionaire's ties to Russia under intense scrutiny. Saudi prince says he twice saved Trump from bankruptcy (Middle East Monitor - link): Saudi billionaire Prince Al-Waleed Bin Talal said he twice saved US presidential candidate Donald Trump from bankruptcy, describing him as a “bad and ungrateful person”. 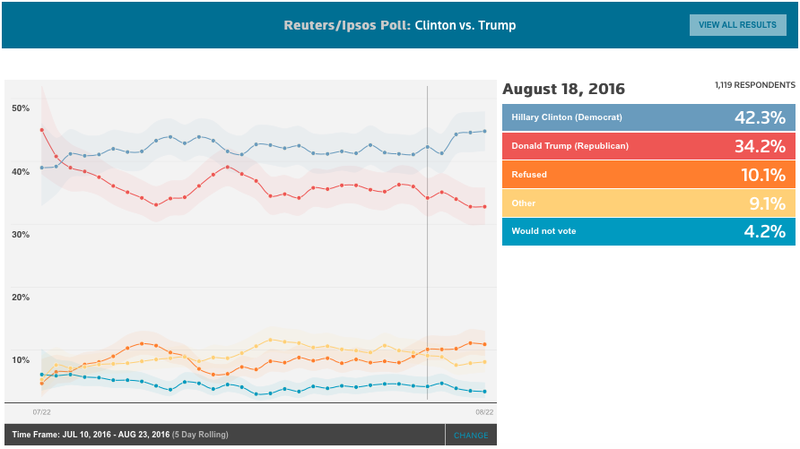 Trump’s Favorite Poll Just Delivered A Devastating One-Two Punch To The Republican Party (Politics USA.com - link): A new Quinnipiac University poll contained the bad news that not only is Hillary Clinton leading by double-digits, but the vast majority of voters have made up their minds. Hillary Clinton leading by ten is very bad news for the Republican nominee, but what is even worse is that 90% of those polled have already made up their minds. Only 9% of respondents said that they are open to changing their minds. This means that even if Trump got all of the people who could change their minds to support him, he would still be losing to Clinton. 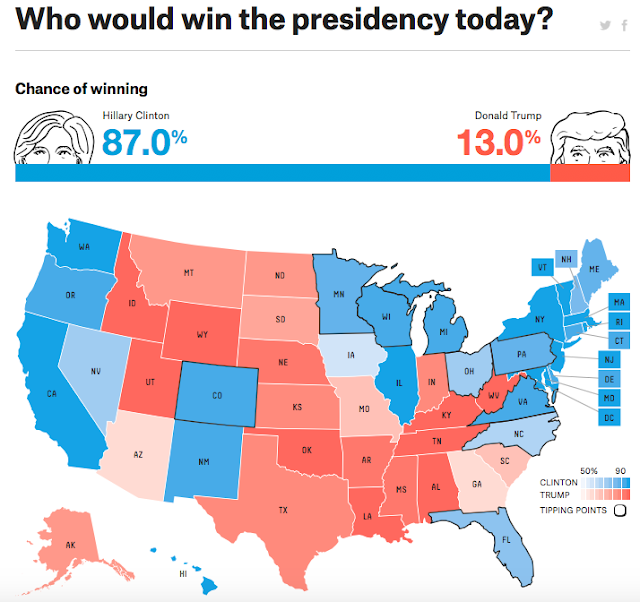 The Quinnipiac results if they maintain and are replicated in other polls will suggest that Donald Trump has entered the territory of being completely unelectable. Trump’s new campaign team doesn’t matter. 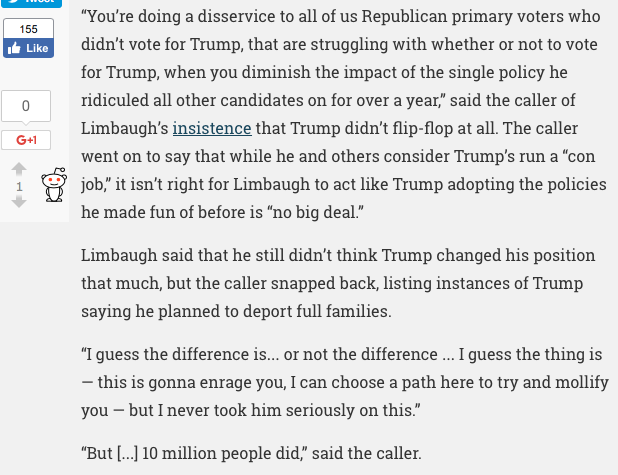 Trump’s changes in policy don’t matter. The presidential debates might not matter. 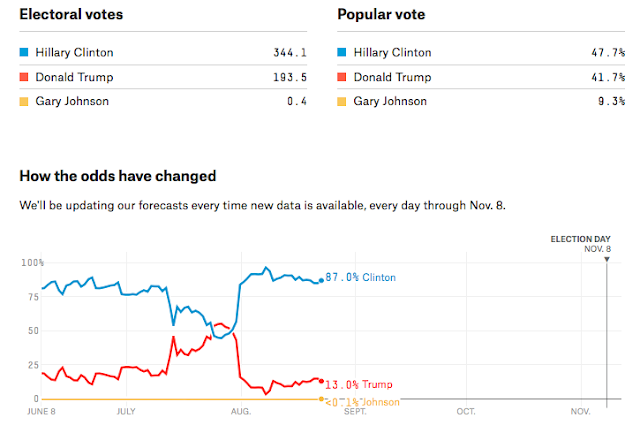 The polling suggests that Trump reacted too late to his slide. Voters say that they have made up their minds. Mod: This isn't that big of a secret, but somehow the corporate media just can't put its fat finger on it. And among the many really big failures in this most awful of presidential campaigns, this has to rank among the largest. First, here is that failure (link). Mod: You can read the rest here. And yes, there is always more. 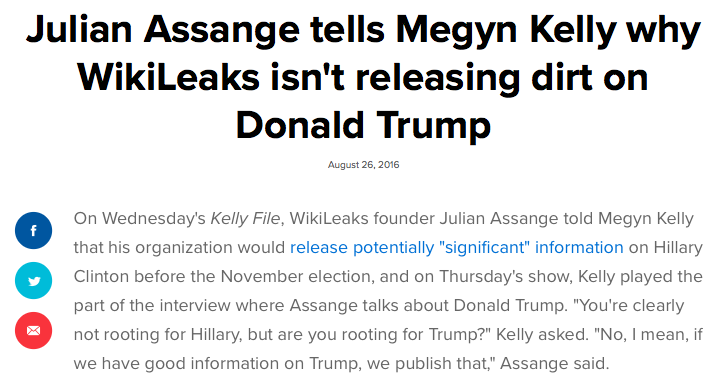 Mod: It is interesting to note that many Trump supporters actually hope the Russian controlled Wikileaks will somehow bail Donald Trump out. Including some who post here. 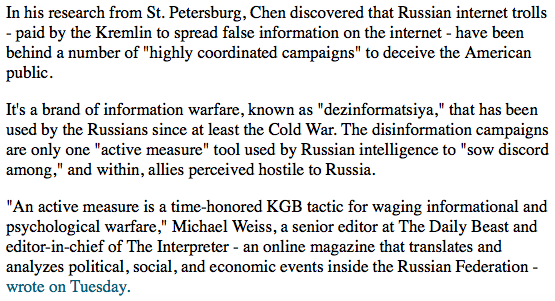 You have to wonder if these self-styled so-called "patriots" understand that they are merely dupes in a strategy being run by Russian intelligence. Link to the above article here. After having endlessly claimed that he was going to build a wall to keep Mexicans out of the United States, Donald Trump has now flip-flopped on it. 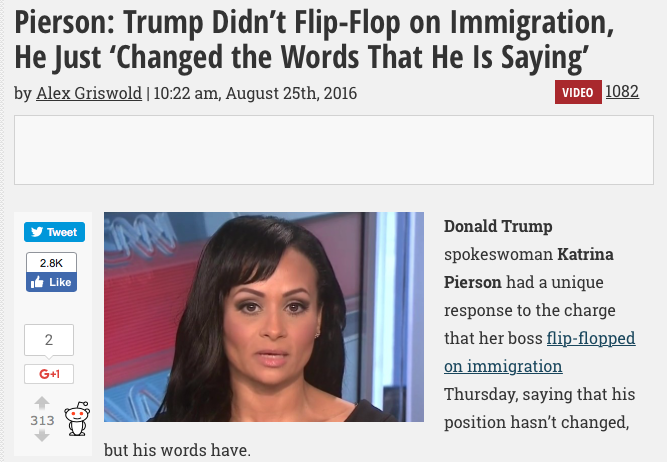 As a matter of fact, Donald has now flipped on that entire issue. 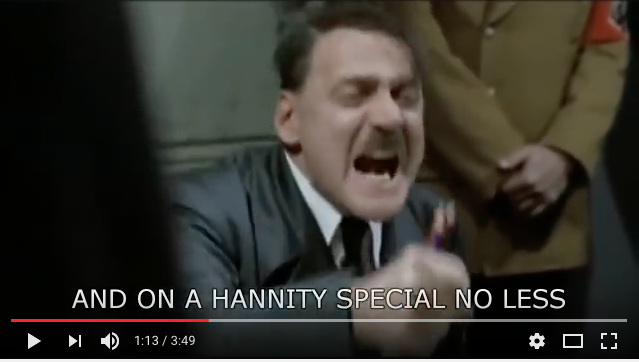 This has upset quite a few of his supporters, but none quite so much as the excitable individual appearing in this following video. Attempts by the Trump campaign to explain this sudden reversal on his signature issue are as stupid and ridiculous as just about everything else they come up with. 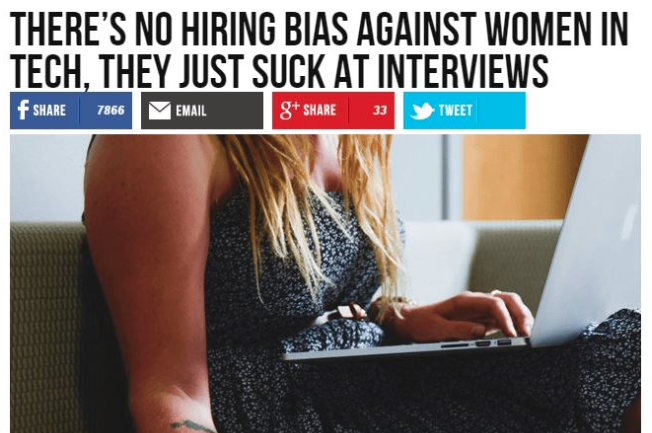 But none is so laughably idiotic as the following found on a news site called Mediaite (link). The most delicious part of the whole fiasco is what this has done to Ann Coulter. She was just about to go on tour behind her new book praising Donald Trump, but after this how can she? Here is how Ann showed her disappointment yesterday. We don't get to see much in the way of national political advertising here in California because the results are pretty much a foregone conclusion. But this one should hit pretty hard in the battleground states. This certainly has been an interesting political year so far. I hope you're having as much fun as I am. Oh dear. 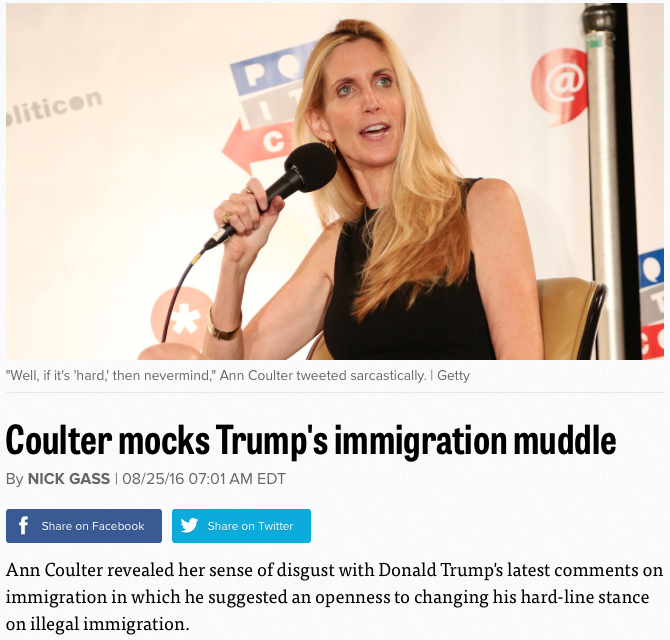 Ann Coulter is not happy with The Donald. Click here for all of the pain. Are a lot of Trump on-line supporters actually from Russia? Mod: If you ever look at all of the mishmash of costly numbers located at the upper right hand corner of your Edison electric bill, you will notice something there called "nuclear decommissioning charges." This is the cash that gets taken from you to pay for the Edison's catastrophic failures at the San Onofre nuclear power plant. A radioactive mess that will somehow have to be contained for a few centuries. Talk about a gift to future generations. To add insult to injury, according to the Los Angeles Times today, those decommissioning charges that you are so generously paying for might not have been assigned to you in the most aboveboard kind of way. And yes, I am sure you are surprised to hear this. 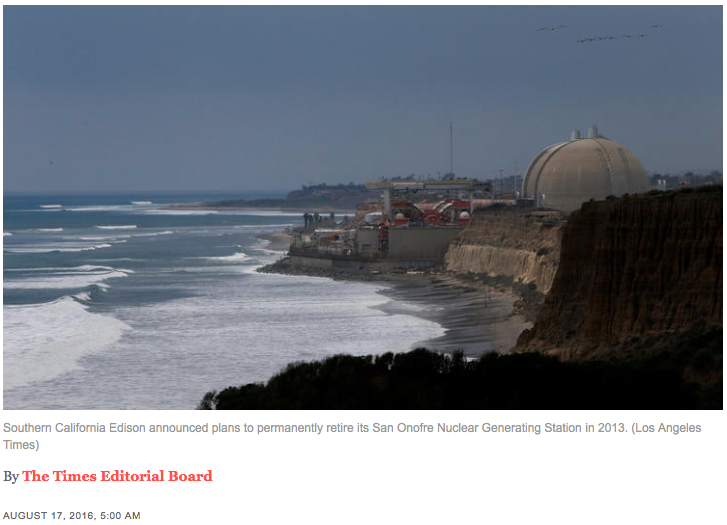 After the San Onofre nuclear plant shut down unexpectedly in early 2012, regulators approved a deal dividing up the $4.7 billion in closing costs. The terms of the settlement were worked out by Southern California Edison, which owns 78% of the plant, in negotiation with San Diego Gas & Electric, consumer advocates and environmentalists. They decided that ratepayers would be responsible for most of the bill — $3.3 billion, minus various credits — while the two utilities’ shareholders would pay the rest. That apparently seemed reasonable to most of the parties at the time, although consumer groups initially wanted investors to pay more of the costs and some smaller stakeholder groups did not agree to the final deal. But the agreement avoided a protracted litigation process that consumer advocates worried could result in a worse outcome for ratepayers if it was influenced by then-PUC President Michael Peevey, a former chief of Edison, who some suspected was not on the side of customers. That deal seems a lot less reasonable now, in light of troubling information that has emerged since about secret meetings to discuss how costs should be allocated between Peevey and Stephen Pickett, who was then Edison’s executive vice president for external relations. The meetings were held during the year before the deal was made. Consumer advocates say they might have rejected the settlement terms and pushed harder for utility shareholders to cover more of the cost of decommissioning if they knew at the time about the meetings, which they say gave an unfair negotiating advantage to Edison at the expense of ratepayers. The PUC in May agreed to reopen the settlement and consider whether it ought to be changed. The secret meetings occurred in March 2013, after the replacement steam generators failed, forcing the plant to close — but before Edison had decided to shut down the plan for good. Peevey and Pickett were both at an energy industry conference in Warsaw at the time. The notes from that meeting, on hotel stationery, appear to lay out possible ways to allocate the costs associated with shutting down the nuclear plant. Mod: You can read the rest here. 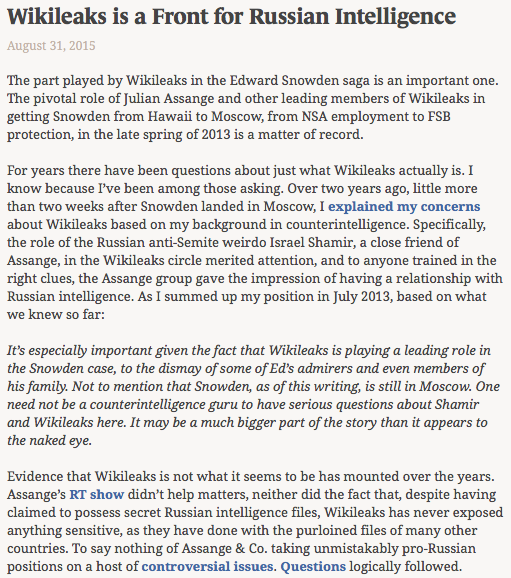 Mod: Interesting Sunday reading from Esquire Magazine - link. 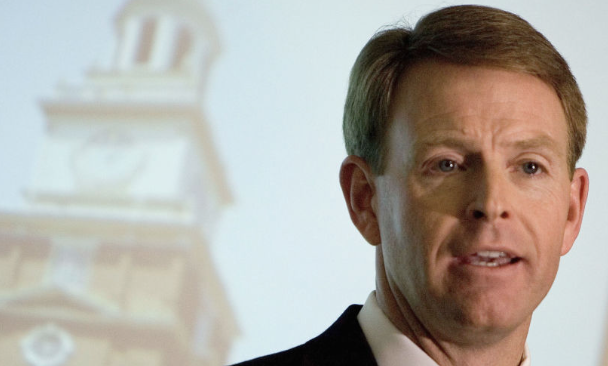 Tony Perkins, who has made a career railing against LGBT people-including saying that God sends natural disasters to punish them-just had his house destroyed by a natural disaster. Perkins is president of the Family Research Council, which the Southern Poverty Law Center classifies as an anti-gay extremist hate group. Tony Perkins also lives in Louisiana, where there's been massive flooding this week that has killed 13 people and destroyed thousands of homes-including Tony Perkins'. "This is a flood, I would have to say, of near biblical proportions," Perkins said, adding that he's now living off "God's provisions." Here, via SPLC, are some other quotes from Tony Perkins. "While activists like to claim that pedophilia is a completely distinct orientation from homosexuality, evidence shows a disproportionate overlap between the two. … It is a homosexual problem." "The videos are titled 'It Gets Better.' They are aimed at persuading kids that although they'll face struggles and perhaps bullying for 'coming out' as homosexual (or transgendered or some other perversion), life will get better. … It's disgusting. And it's part of a concerted effort to persuade kids that homosexuality is okay and actually to recruit them into that lifestyle." "Those who understand the homosexual community-the activists-they're very aggressive, they're-everything they accuse us of they are in triplicate. 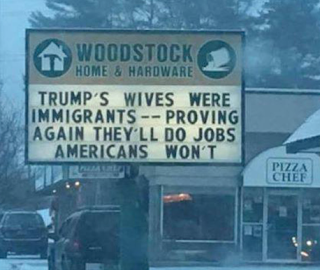 They're intolerant, they're hateful, vile, they're spiteful. .... To me, that is the height of hatred, to be silent when we know there are individuals that are engaged in activity, behavior, and an agenda that will destroy them and our nation." And, in a 2015 interview, he agreed with extremist Messianic Jewish pastor Jonathan Cahn that Hurricane Joaquin was a "sign of God's wrath" over the legalization of gay marriage and abortion, saying: "God is trying to send us a message." Was God trying to "send" Tony Perkins a message this week? Or was He trying to "send" Ted Cruz a message, who appointed Perkins to his failed presidential campaign's "advisory council for religious liberty?" 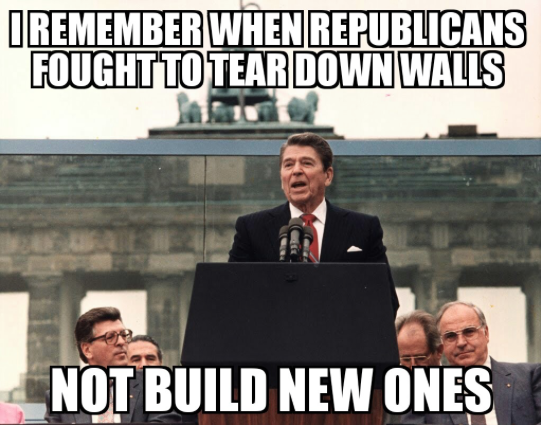 Or was He trying to "send" the Republican National Committee a message? After all, they allowed Perkins to play a decisive role in crafting the Republican Party platform last month, including a fun little provision that advocated for sending LGBT people to gay conversion therapy-a thoroughly debunked and possibly destructive method of "treatment." Or is Perkins just a normal person, like LGBT people, who now has to overcome adversity? I have no idea what happened, nor do I really care all that much. But there is something about this that is kind of disturbing. You say they “apparently arrived a few minutes before the concert and proceeded to neatly fold and set aside” your blankets. Did you see them do this? Did anyone see them do this? No! These two “rude and boorish” ladies happen to be Matriachs in this great city, residing here since 1950s, raising their families of six and eight children, attending St. Rita’s Church every Sunday and sacrificing many hours ( years) of dedicated service for many community events. Yup, Sir (and I say this reluctantly), are the one who should be ashamed for your rude and boorish behavior by harassing and threatening them. As for your ethical guidelines and responsible citizen remarks, perhaps you should take a look in the mirror and ask yourself if it’s appropriate to verbally abuse two very fine, morally upstanding women in their mid-80’s- with no basis whatsoever. Could you imagine if people actually got as upset about unfair and dishonest taxation schemes or crumbling infrastructure as some do when squabbling over blanket placement at a Memorial Park concert? The New York Daily News has a great article up this morning called "Trump not crazy enough for you? Here are five ideas spread by the site run by the mogul’s new campaign CEO" (link). The website referred to is Breitbart, and it is just about as far to the right as you can get these days. Republican presidential nominee Donald Trump has hired Breitbart News executive chairman Stephen Bannon as his new campaign chief executive. Here are a few of the ways the Daily News describes the kinds of unpleasant and conspiratorial things advocated for by Mr. Bannon, this week's latest flavor of the week guy hired by Donald Trump to run his campaign. 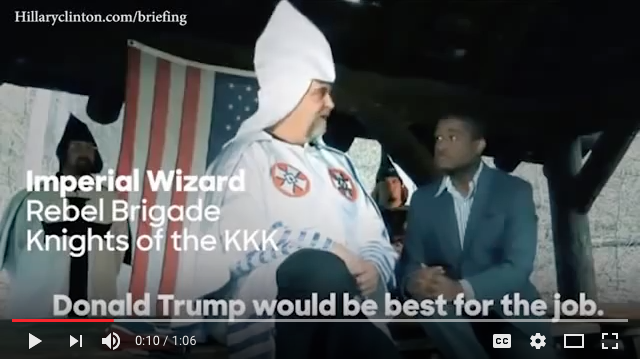 White Supremacist Leanings: Breitbart News has often been accused of spreading the same race-baiting diatribes and thinly veiled white nationalist leanings as Trump himself. Much of those have been written by controversial columnist Milo Yiannopoulos, who has frequently littered the internet with overtly racist and hateful statements. 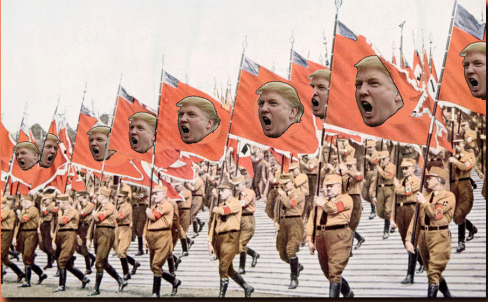 In March he penned a comprehensive defense of his opinions and theories, many of which have been deemed by the Southern Poverty Law Center as evidence of a "a noticeable shift toward embracing ideas on the extremist fringe of the conservative right." Anti-gay Rhetoric: In the same vein, Breitbart News has been accused of pushing anti-gay bigotry and has even given a mouthpiece to anti-LGBTQ hate group leaders like Austin Ruse. Ruse's faction, the Catholic Family and Human Rights Institute (C-FAM), has been labeled a hate group by the SPLC. Ruse, for example, has written on Breitbart about hateful conspiracy theories surrounding the tragic death of Matthew Shepard, who was beaten and tortured in a brutal hate crime in Wyoming in 1998. Trump reportedly paid for good coverage: In addition to spewing pro-Trump odes and anti-Clinton conspiracies, Breitbart News actually took money from the bigoted billionaire — a sinister exchange that has cast a wide shadow over the site's credibility. 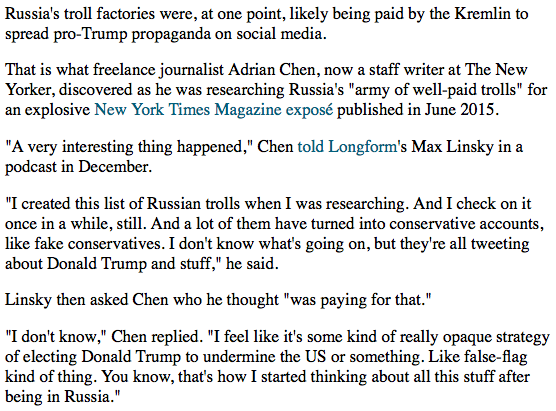 "The company's top management was allowing Trump to turn Breitbart into his own fan website — using it to hype his political prospects and attack his enemies," BuzzFeed News reported in August 2015. Breitbart editors and writers alleged the company had a financial arrangement with Trump, according to BuzzFeed. Classy, all the way. 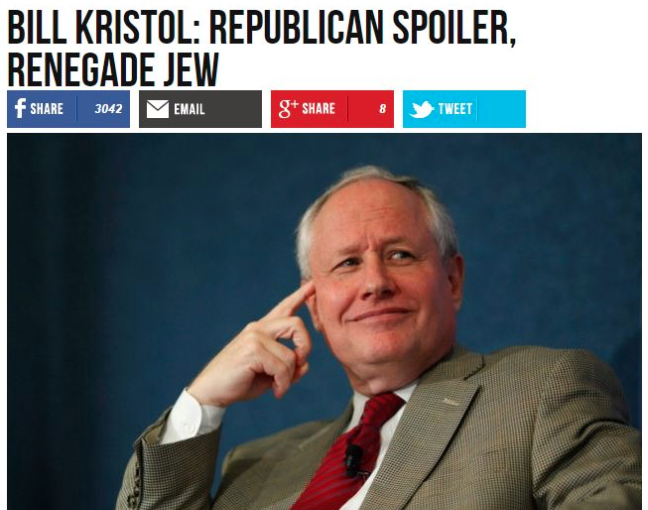 To put this all into perspective, here are a couple of recent articles run on Breitbart. Just to give you an idea of the kinds of things Donald Trump finds to be informative and enjoyable reading. So much so that he hired the guy responsible for them to run his presidential campaign. 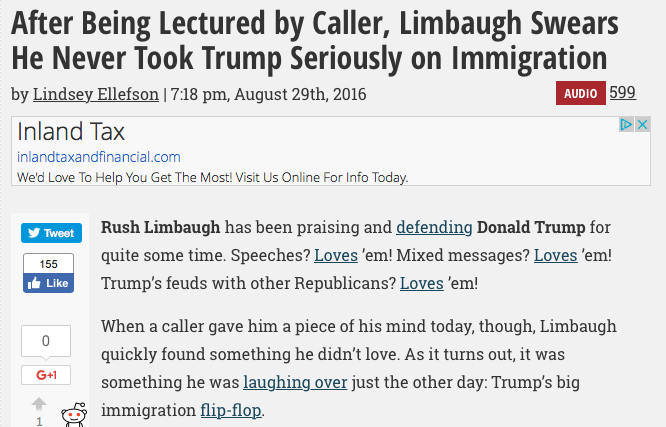 These - and many other examples - are featured in a Media Matters post called "Breitbart News’ Worst Headlines" (link). Bill Kristol being a Republican conservative who has shown the unfortunate temerity to criticize the always thin-skinned Donald Trump (link). These are certainly not the kinds of things you would have found on the resume' of someone running the campaign of a major party presidential candidate in the past. Or at least not in the United States. Then again, we have now boldly entered into a whole new kind of crazy now. Alt Right Rejoices at Donald Trump’s Steve Bannon Hire: As Breitbart’s chief, Steve Bannon did a lot to normalize the racist, anti-Semitic world of the alt right. Now they rejoice as he joins the campaign of their king. 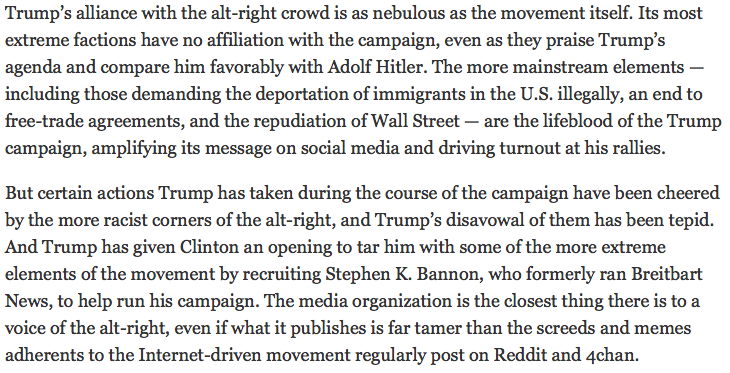 Donald Trump’s campaign is under new management—and his white nationalist fanboys love it. The campaign’s new chief executive, Stephen Bannon, joins from Breitbart News—where he helped mainstream the ideas of white nationalists and resuscitate the reputations of anti-immigrant fear-mongers. Just when you thought this election wasn't scary enough. So let's see if I have this straight. 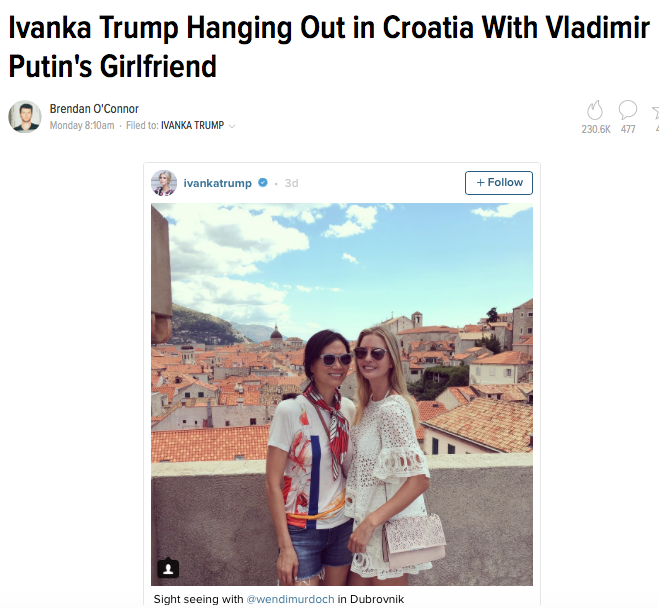 Wendi Deng is the girlfriend of Vladimir Putin. But she is also the ex-wife of Fox News owner and all-around media empire billionaire Rupert Murdoch? And a dear friend of the Trumps as well? Amazing. Wendi Deng is a one woman Bilderberg. I picked up on this article from my Google News feed. I don't know if you are aware, but you can identify any number of topics of interest to you, input them into the easy to use application found there, and should something show up on the Internet somewhere regarding your concern it will appear in your email within a matter of minutes. Just in case you are wondering how I manage to come across such things. And frankly, this one is quite interesting. It comes from a venerable legal news service called The Los Angeles Journal (link), which apparently has been around from way back in the 1800s. It is a subscription only site, so I am not able to provide you with a direct link to this particular article. But as a service to you, the concerned Sierra Madre resident who needs to know, I am reproducing it here. All of which sounds somewhat good. After all, who could ever have a problem with helping out po' bucker litigants with potential $100 million dollar lawsuits on their hands? Legal counsel does not come cheap, after all, and you will always need money to make money. However, and as any close follower of the governmental and legal affairs of this portion of God's greatest land is likely to tell you, larding something over with the familiar language of social concern does not necessary mean that this interesting legal service will limit itself to just the downtrodden and oppressed. Not when there is some of that long green to be made. After all, isn't it true that when you want to sell people on something in California, the proven way of doing so is to claim it will help make the world a better place? Investors take note. 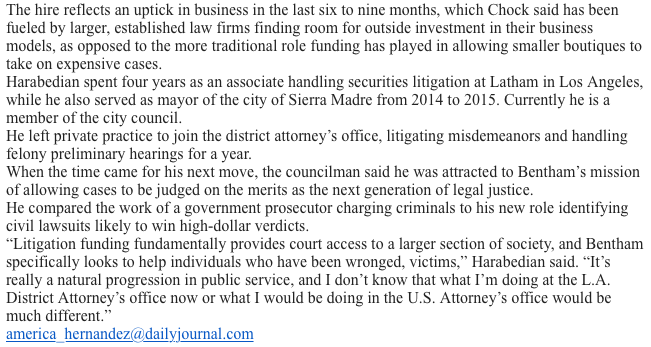 I was fortunate enough to be able to discuss today's news with someone who knows a lot about this expanding niche legal field, and he enlightened me about some of the claims our guy John Harabedian makes for himself in the above article. The obvious undertone being that he is taking a very lucrative position and spinning it as the embodiment of advanced legal social responsibility. 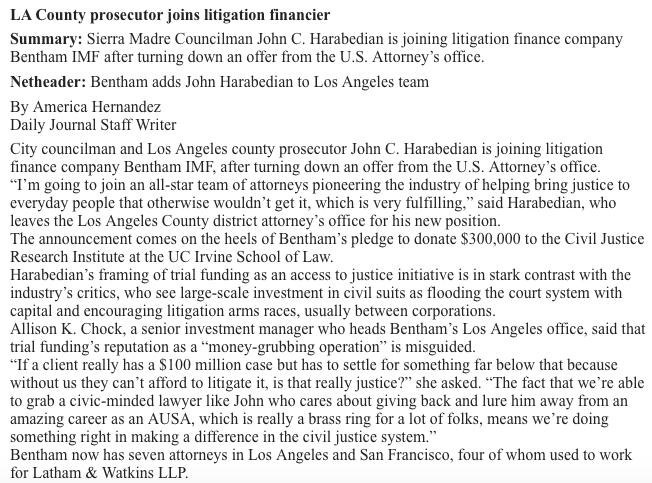 - Harabedian will be salaried and highly paid, but Bentham, the company, operates on the premise that they’re “evening the playing field.” They find cases likely to win, that normally would take too much money and time to litigate, and fund the attorneys working on them, knowing that they, the investment company, will get a cut of the ultimate award. - It’s very hush hush, you rarely find out which cases they are even involved in, but this company will at least tell you they have a 90% success rate of winning cases, so far they have put money into 180 lawsuits and have gotten back $1.7 billion from their investments. - The red herring Harabedian flies is that they’re helping fund the cases of average joe’s who have been wronged and can’t afford to litigate their cases. The reality is they only really pick large commercial litigation where the payout is big enough to be worth their while. So two big companies fighting over trade secrets or breach of contract would be an obvious example. Opponents of the practice say it’s flooding the system with frivolous lawsuits. - Harabedian will decide quietly, confidentially, to back this company or that company in its suit, because even if the business in legal trouble is rich and powerful, it can’t put so much of its capital at risk litigating. So he gets big business connections by deciding which corporation gets to have their bill footed in the short term, based on strength of case and wealth of opponent. Part of it is the merits, but who wouldn’t get a better chance at winning with unlimited funds to litigate and appeal? It’s a blank legal check and he’s the new gateway. - Even if everything stays above board, the more believable story is he’s taking the revolving door special interest business route up the ladder, so it is a time-honored political path. Harabedian is just trying to spin it as something less sinister than what it is. A press release from Bentham IMF is available on-line and you can link to it here. Note this line: "Clients utilizing Bentham’s funding have retained an average of 63% of all case proceeds." I guess that leaves 37% for the investors. Operators are now standing by to take your call. 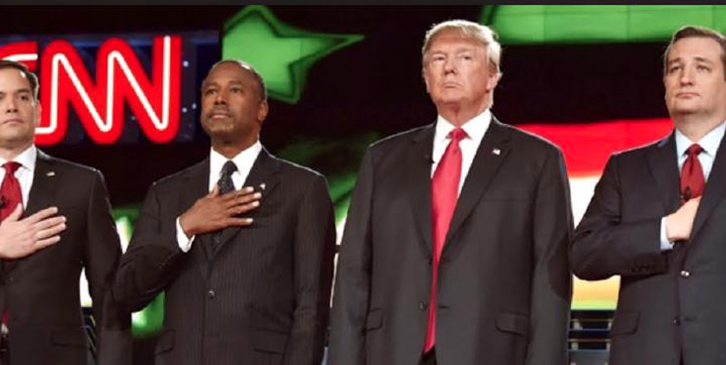 Is Donald refusing to honor America? Mod: Yesterday's New York Times revelation (link) that $12.7 million in undisclosed cash payments had been made to Darn Old Trump's campaign manager Paul Manafort by pro-Russian Vladimir Putin political party hacks from the Ukraine is blowing up in full technicolor today. Here's a few stories that lay this all out. Internet freaks after Lewandowski posts Times story on Paul Manafort’s sketchy ties to Ukraine (link): The New York Times dropped a bombshell Sunday night revealing an expose on Donald Trump campaign chair Paul Manafort’s ties to Ukraine. According to the story, Manafort’s work was consulting for Ukraine’s political party in power. Investigators say the network Manafort is associated with was once used to steal assets and control elections in the country. 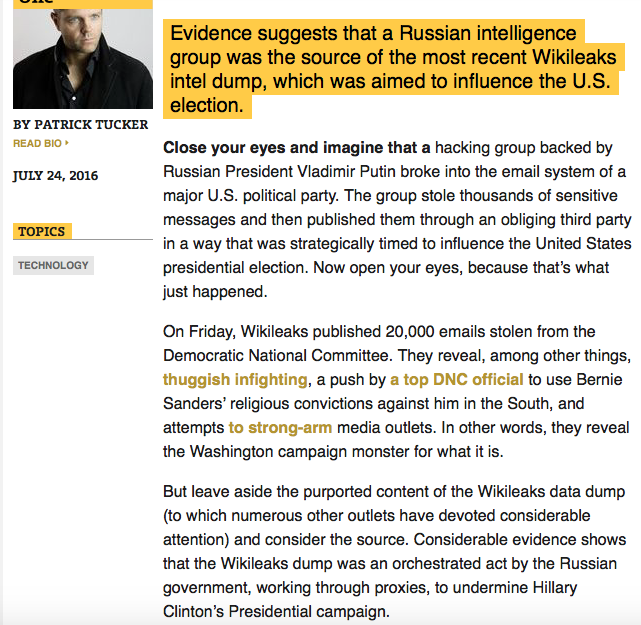 The ties to Russia and Ukraine came under attack when the FBI found that Russian government hackers were responsible for the hacking of the Democratic National Committee. Interestingly, the DNC staffer who was researching Paul Manafort’s ties to Russia had his personal data targeted. Manafort has been doing international consulting since the 1980s, particularly for dictators, including Viktor F. Yanukovych who was removed after an uprising in Ukraine before fleeing to Russia two years ago. Since leaving, investigators have looked into practices under Yanukovych and found what they called the “black ledger,” a list of names and how much cash was doled out to them. The ledger was in a third-floor room of the Party of Regions headquarters along with two giant safes filled with $100 bills. Over the course of five years, Manafort’s name appears 22 times totaling $12.7 million. It wasn’t long before Trump loyalist and paid CNN shill Corey Lewandowski tweeted the story. Lewandowski and Manafort were notorious for infighting on the Trump campaign while Lewandowski was at the helm. He’s also spent the last few months, since being fired from the Trump campaign, attacking Manafort in the media, including calling for Manafort’s immediate dismissal after Melania Trump’s plagiarism scandal at the Republican National Convention. 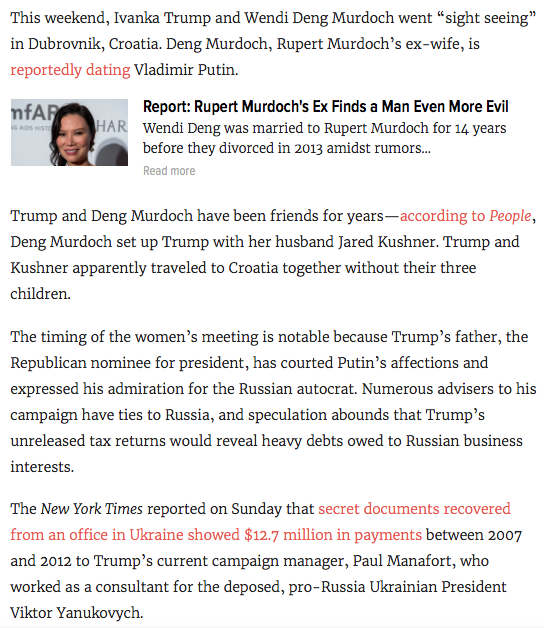 The Trump campaign meltdown began late Sunday evening when the NY Times published the story exposing Manafort’s millions of dollars in hidden illegal payments from Vladimir Putin lackey Viktor Yanukovych. Corey Lewandowski, who had been Trump’s campaign manager until he was fired this spring and replaced with Manafort, tweeted out a link to the article as if to gloat about the fact that his replacement is being taken down by a corruption scandal. 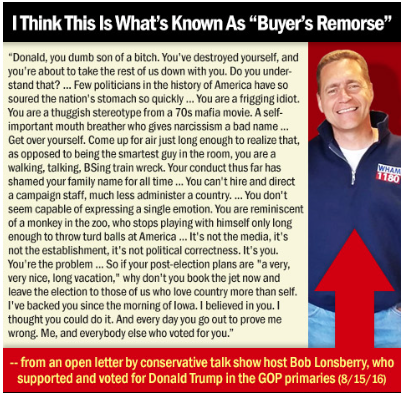 Even as Corey Lewandowski was enjoying his revenge, another Trump surrogate Roger Stone got wind of it and fired back by claiming that Lewandowski was now “working for Hillary Clinton” by way of calling him a traitor. Lewandowski actually works as a commentator on CNN now, and it’s not clear what his on-air approach will be to the Manafort story, as CNN wasn’t broadcasting live news on Sunday evening while the drama was exploding. Meanwhile Donald Trump himself has had nothing to say about the matter, but he now has several problems. There’s the fact that he may have to fire Paul Manafort due to his illegal financial connections to Russia’s Putin. There’s the fact that Corey Lewandowski appears to be so excited by the downfall of Manafort he’s no longer remaining loyal to Trump. And there’s the fact that Roger Stone is now publicly attacking Lewandowski. It all leads to the question of just who might be running Donald Trump’s campaign by the time the smoke clears tomorrow – if there is indeed anything left of his already dying campaign to salvage. Clinton campaign responds to shocking revelations about Paul Manafort’s pro-Kremlin ties (link): Clinton campaign press secretary Robby Mook issued a late-night statement on the bombshell in the recent New York Times detailing Donald Trump’s campaign chair Paul Manafort and his questionable dealings in Ukraine. Mook notes that this comes just before Trump is scheduled to give a major foreign policy address Monday on what his strategy will be if he is elected as president. Mod: Here is my question. Can you support Donald Trump and still claim to be a patriot? 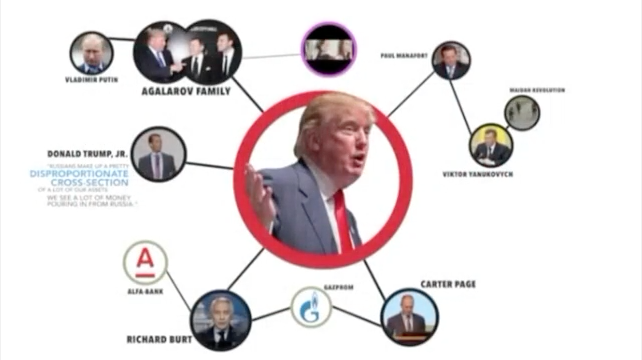 What is Donald Trump's connection to Vladimir Putin? Another interesting video has turned up, and I am anxious to share it with you today. 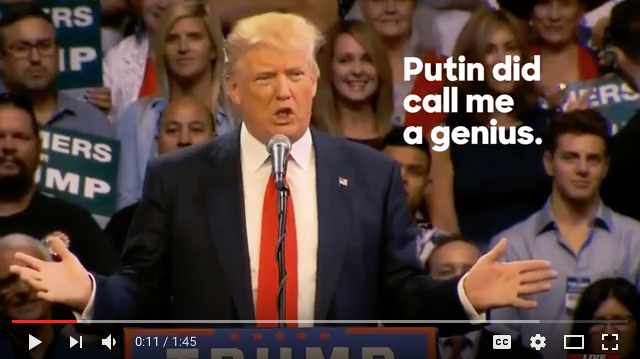 To view this video about Putin's apricot colored genius click here. One more. After all, it is the weekend. After watching these two videos, can you say with certainty that Donald Trump has not betrayed this country and its people? 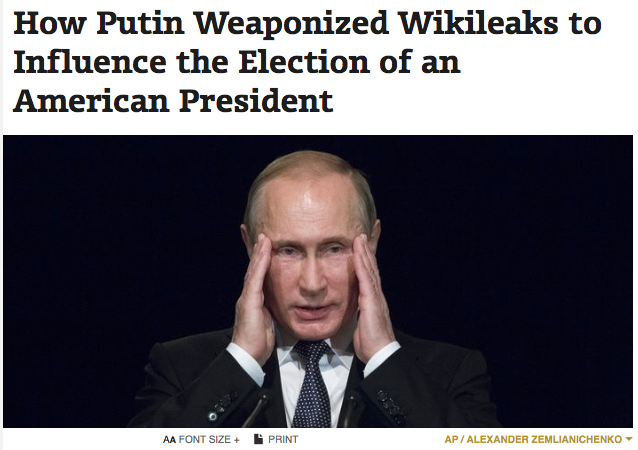 Can it be the GOP nominated an actual traitor? Megan Corinne Sterling, 34, of Sierra Madre.